Krishna is worshipped in hundreds of temples across the world. Some of them hold a special significance as they are associated with the life of the Lord and some others are important because of their historicity and the aura of spirituality associated with them. A few temples stand out conspicuously above other places of Krishna worship as they are directly associated with the events in the Lord’s life. They are generally located at Mathura, the place of Krishna’s birth, Vrindavana, where he spent most of his childhood days and Dwarka where he spent most of his adult life. Sri Krishna appeared over five thousand years ago in Mathura as the eighth child of Devaki and Vasudeva. Kansa was the king of Mathura and maternal uncle of lord Krishna .The place of His birth is known as Sri Krishna JanmaBhumi. Numerous articles excavated from the site bear testimony to the legendary story of Sri Krishna’s birth. These artifacts are displayed in a museum near the main temple. One can find so many small shrines of other gods and goddess in the temple premises. This temple complex presents a magnificent and colossal structure that happens to be the most familiar place of Hindu adulation. Its popularity reflects in the long queue of the pilgrims who stands there for hours to have a holy darshan of their beloved lord. The birth place of Lord Krishna, “the best known, best loved and most complex of Lord Vishnu’s manifestations” – Mathura is today an important place of pilgrimage. Studded with a number of ancient and modern temples, Mathura is the abode of God and divinity. Hinduism finds here a new dimension which is the colour of love with which Lord Krishna wanted to bind this entire world. The mild sound of devotees taking the hundred and eight names of Lord Krishna all day long covers the entire ambience of Mathura. The immense belief of the pilgrims coming here from different parts of the world is something that gives Mathura a well-deserved importance in the itinerary of Indian pilgrimages. It is true that Mathura is the holiest, and it is the only place in the universe where Brahma and Shakti have been manifested at the same place. It is in Mathura that Leelapurushottam Shri Krishna and Ashthabhuja Ma Yogmaya manifested. The clearance of the birthplace of Lord Shri Krishna led to the recovery of many portions of a 1500-year-old temple, including the sanctum sanctorum (Garbha Griha) and a throne. The Medhi and sanctum sanctorum have been preserved. It is, indeed, the blessings of the Lord that when Emperor Aurangzeb demolished the temple and erected the Idgah on its plinth, the Idgah was actually constructed on the Sabha Mandap (prayer-hall) of the temple; the sanctum sanctorum, miraculously, remained intact and got buried under the debris. Resurrection of such an auspicious place has ensured that the devotees, once again, can enjoy the blessings of the Lord at His birthplace. The magnificent and large Bhagavata Bhavan was constructed in honour of Shrimad Bhagavata. The Bhagavata Bhavan comprises, primarily, of five temples. The main temple is Radha-Krishna Yugal Sarkar, which draws the devotees and fills them with the sense of the divine presence of Shri Radha-Krishna. On the right is the temple of Shri Balram, Subhadra and Shri Jagannathji. On the left side is the temple of Shri Sita, Ram and Lakshmanji. In front of the temple of Shri Jagannathji, Shri Chaitanya Mahaprabhu is seen paying obeisance to the Lord beside the Garud-sthambh. In front of the temple of Shri Ram, Shri Hanumanji is seen standing, paying obeisance with folded hands. In front of Shri Chaitanya Mahaprabhu, we can have the darshan of Goddess Durga in her divine splendour. Shri Keshveshwar (Lord Shiva) is present here in the form of a mercury Linga. The idols in these temples have special features. Those of Radha Krishna are of human size, nearly six feet high. The idols of Shri Jagannath, Subhadra and Balram have been made by the same sculptor who crafted the idols at Jagannath temple, Puri. Even the wood used is the same i.e. Nimba Kashtha. Lord Keshveshwar is portrayed in his own mercurial Linga form, which has been solidified by mixing mercury with herbal extracts without the use of any metal alloy. This mercury Linga is, perhaps, the only one of its kind. Ancient scriptures say that those who pay obeisance to the mercurial Shiva Linga get their sins washed away. The darshan of the mercurial Shiva Linga is supposed to be as auspicious as darshan of the twelve Jyotirlingams. Lord Keshavdev, the ancient deity of the 12 Goswamis families. This deity has the icons of 24 avatāras of Lord Krishna (Vishnu) around Him. One can see that only once a year, on Akṣaya Tṛtīya Day, when the Lord has His Chandan Yātra, and His entire body is smeared with sandalwood paste to cool Him in the summer heat. Originally Lord Keshavdev is one of the deities installed by Lord Krishna’s great-grandson after Lord Krishna departed this world. Megasthenes described Mathura as “a place of great regional importance” and suggested that it was then, as now, “a center of Krishna worship.” Christian Lassen noted that Megasthenes wrote of Krishna under the pseudonym of Heracles and that “Heracles”, or Krishna, was worshipped as God in the area through which the Yamuna River flows. A respected Indologist, Richard Garbe, agreed with Lassen’s analysis and called the testimony of Megasthenes indisputable. Soon, scholars like Alan Dahlquist, who had formerly supported the “borrowing theory,” changed their minds and admitted, in Dahlquist’s words, that Garbe had “exploded Weber’s theory once and for all.” The life of Krishna and the religion of Vaisnavism had not been influenced by Christianity, but had appeared autonomously on Indian soil and was already well-established by at least the third century BC. The Mathura administration has found clinching evidence which proves the Hindus’ claim that the Shahi Mosque at Mathura was built over Shri Krishnajanmabhoomi temple. According to the locals, on August 14 the local administration started digging in the courtyard of the mosque for construction of some rooms for the security staff. During the digging process, the labourers found stone pillars, carving and an idol of a Hindu God. They immediately reported that matter to the authorities. During the excavation work, various things were recovered that confirm this story. The articles that were recovered include utensils, some old figurines, and a rock platform that were commonly seen in the prisons of that period. These articles are displayed in a museum. Krishna Janmabhoomi Temple shares a common wall with a mosque, due to which there is heavy security in the temple. The present temple was built in the 20th century. A stone slab is present in the temple that symbolizes the original site where Lord Krishna was born. Mathura is one of the most ancient towns of India and finds mention in the Ramayana, the oldest epic. This place was thickly forested and was known as Madhuvan then Madhupara and later on Mathura. Mathura became the capital of the Shursen republic in the 6th century BC and soon after was ruled by the Maurya Empire and the Sunga dynasty. Archaeological proof seems to point that, by 100 BC, Jains used to live in Mathura. The art form of Mathura and its culture reached its summit under the Kushan dynasty who had declared it as their capital. Many Buddhist relics have been found in the Mathura area. Many of which are found in the museums in Mathura, Calcutta and Lucknow. Sri Krishna Janmabhoomi Temple was built over the prison which was believed to be the birth place of Lord Krishna. This temple was constructed five times. According to the epics and folklore of the area, the temple was first constructed about 5,000 years ago by the great-grandson of Lord Krishna, Vajranabha. Second time, the temple was built in 400 AD, during the reign of Chandragupta Vikramaditya, a Gupta Emperor. It was said that this temple was so beautiful that neither a painting nor a description could describe its grandeur. In 1017 AD, the temple was destroyed by Mahmud of Ghazni. In 1150 AD, a person named Jajja constructed the temple for the third time during the reign of Raja Dhrupet Dev Janjua, Emperor of Mathura. Sri Caitanya Mahaprabhu (a Vaishnava saint) visited this temple in 16th Century. Later this temple was destroyed by Sikandar Lodi (Sultanate of Delhi) in the 16th Century. About 125 years later, Raja Veer Singh Bundela of Orchha (or Urchha is a small town in Madhya Pradesh) constructed the Keshav Deo temple for the fourth time during the reign of Jahangir (Mughal Emperor). He built the temple with Rs 3.3 million. Again in 1669 AD, Aurangzeb destroyed this temple and built a mosque in its place known as Jami Masjid. He used the materials of the temple to construct the mosque. In 1803, the city of Mathura came under the rule of British. In the year 1815, the East India Company auctioned the temple area. Raja Patnimal of Banaras bought the temple land to rebuild the temple. But his wish was not fulfilled. Later, Late Mahamana Pandit Madan Mohan Malaviya took the initiative to reconstruct the temple. He took financial assistance from Late Seth Jugal Kishoreji Birla. Jugal Kishoreji Birla established ‘Sri Krishna Janma Bhoomi Trust’ on 21st February, 1951. With the rigorous efforts of many people from 15th October, 1953, the construction of the temple was completed in February, 1982. The history and culture of this holy town revolve around the legends of Lord Krishna’s childhood. The great scholar Srila Vishvanatha Chakravarti neatly outlines Sri Krishna’s activities in this way: the first three years and four months were spent in Gokula, then equal lengths of time in Vmdavana and Nandagram, eighteen years and four months in Mathura, and finally ninety-six years and eight months in Dvaraka totalling 125 years of manifest pastimes. As the legend goes, Mathura was founded in the Treta era by Shatrughna, the younger brother of Lord Rama and later was under the royalty of King Kamsa, the maternal uncle of Lord Krishna. According to Hindu mythology, Kamsa heard a divine prophecy saying that he would be killed by his sister Devki’s eighth son Krishna. Hence, he imprisoned Devaki and her husband Vasudeva and kept on killing their children one after another. But when Lord Krishna was born, miraculously all guards went to sleep, prison gates opened and Vasudeva carried his son to Gokul crossing the wild river Yamuna in the mid night. The divine prophecy came true and Krishna killed tyrant Kamsa and ruled Mathura for a long time. Vrindavan is the place where Lord Krishna spent his childhood leaving a number of myths and legends of love and friendship behind. The beautiful city of Mathura lying on the banks of the great river Yamuna is considered to be one of the most ancient cities known to mankind. The history of Mathura dates back to 1600 B.C. going by the archaeologists. The city is considered to be the birth place of Lord Krishna according to Hindu mythology. The city is one of the most prominent places in the epic Mahabharata. It is known as the ‘Athens of ancient India’. The famous Greek traveler wrote about Mathura as the biggest kingdom rule by a small king in his book about his Indian odyssey ‘Indika’. He also described the people of Mathura as culturally rich and highly organized. According to Garuda Purana, Mathura along with Ayodhya, Avantika, Kasi, Puri, Kanchi and Dwarika are the seven sites which grant moksha. Though the city is linked mainly with the life of Lord Krishna, it is special even for Jains and Buddhists. Mathura’s holy ghats and serene banks of river Yamuna give a tranquil feel. Mathura holds strategic importance to India. It is the base of India’s strike corps I within Indian Army’s central command. Mathura has had a rich heritage and has contributed richly to Indian culture. Mathura’s culture, its literature, songs, dance and cultural events revolve around the life of Lord Krishna. The culture of the people of Mathura is known as Braj culture. Various daily practices of the people of Mathura bring out the Braj culture Rasiya, a tradition of folk songs that describe the love of Radha and Lord Krishna is an integral part of Mathura’s culture and of the festive celebration of Mathura. Mathura is known for Sanjhee, the art of decorating the ground with flowers. Raaslilas is a dance act that was performed by Lord Krishna along with gopis on banks of Yamuna River. Mathura museum is famous for the ancient sculptures of Mathura School of Art, it is an archeological museum. One more aspect of Mathura that fascinates is how people from different nationalities, religion and race are getting painted with the colour of love of Shri Krishna. Mathura is truly a global city where people from various corners of the world come, lose themselves in the Krishna-divinity and start a new life in the ancient and narrow lanes of Mathura. You will find hundreds of ISKON (International Society of Krishna Consciousness) followers from foreign lands chanting Sanskrit mantras effortlessly. The basic structure of temples in India is a room or garbhagriha (sanctum sanctorum) where the image (murti) of the main Deity is kept. The temple is approached by a flight of steps and is often built on a platform. A porch covers the entrance to the temple, which is supported by carved pillars. A prominent roof called the shikhara surmounts the top of the garbhagriha, and dominates the surroundings. As time went by, small temples grew into temple complexes. Some temples have a hall (mandap) from where one can see the sanctum sanctorum. Pothra Kund: This is a pond close to Janma Bhoomi. Vasudeva and Devaki used this pond for washing their clothes when they were in prison. Sri Krishna Janma Bhoomi: This prison is the place where Lord Krishna was born to Sri Vasudeva and Yasodha Matha. There is a temple built at a later date. Inside we see Lord Krishna. There is a photograph of Lord Krishna here, which looks very much alive. The whole place is under security. There is a big hall in which we see huge sculptures of Lord Krishna and Radha. There are small sanctums for Durga, Navagraha etc. As we go around inside from a window we can see a huge wall of a mosque near the temple. Here they point to a place and say that was supposed to be the original place of jail. Swetha Varaha: Here Varaha is seen in white marble stone and known as Swetha Varaha Swami. The present temple has been constructed in the 20th century. A stone slab marks the original spot of the birth of Lord Krishna. The earlier Kesava Deo temple had the room where Lord Krishna was born. The only dampener is the heavy security cordoning that has been done in this area. One has to go through complex and long security checks before getting entry into the complex. There is a dispute regarding a mosque that shares its wall with the temple. Samyamana Ghat: This ghat is on the bank of River Yamuna. This is the ghat from where Vasudeva shifted Lord Krishna to Brindavan. Visram Ghat: This is the ghat where Lord Krishna had a bath after Kamsa was killed and took rest. 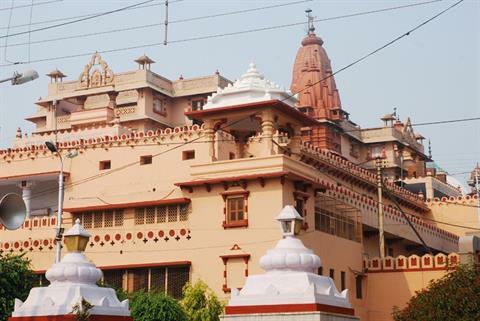 Mathura & Vrindavan, the twin sacred towns of Hindu religion are situated in the state of Uttar Pradesh in India. Situated on the banksof the river Yamuna, both the places are closely and equally associated with religious sentiments of the people. Both Mathura and Vrindaban are believed to be the ancient birth places and playground of Lord Krishna. Holi : is celebrated on the full moon day in the month of Phalguna (Feb-March). Holi in Braja is celebrated for several days, at different places around Braja, before the actual day of Holi. Basantha Panchami: the advent of spring is celebarted with folk and traditional flavour. Maha Sivarathri: The divine birthplace of Lord Shri Krishna reverberated with the chants of Lord Shiva on the auspicious occasion of Mahashivaratri. Janmashtami : the day when Lord Krishna was born is no wonder celebrated with much pomp and show. People enact the many legends during the time of Lord Krishna and folklore and recitals take place throughout the night. Deepavali: On the day following Deepawali, Goverdhan pooja is celebrated when a splendid offering of chappan Bhog (56 variety of sweets and savories) is organized by the sansthan. The grand feast is offered at the Shri Giriraj Temple, Shri Radha Krishna Temple amid other temples at Janmasthan premise. Sharad Purnima: Lord Shri Krishna had performed His Maharaas Leela on Sharad Purnima. Therefore, on Sharad Purnima – the auspicious full moon night, an elaborate Maharaas programme is organised at Shri Krishna Chabutra. Goopashtami: On this day, Lord Keshavadeva is dressed up most beautifully in the attire of a cowherd. Using the soil, flowers, plants, tress and other articles from the Braja region, a forest-like scene is created in the Keshavadeva temple. On this day, worshipping and serving cows is considered to be auspicious. 4.00 P.M. to 9.30 P.M.
3.00 P.M. to 8.30 P.M.
5.30 A.M. to 8.30 P.M.
By Road: Mathura is 150 kilometers by road from Delhi. The journey is by a well-constructed highway, NH-2 and Mathura can be reached within three hours. Buses and private vehicles regularly ply between Delhi and Mathura. By Rail: Mathura is a prominent railway station in Northern India. Therefore, almost all trains from all over India that passes through the region, halt at Mathura. From Delhi, Taj Express leaves Nizamuddin Railway Station early in the morning, and reaches Mathura in a couple of hours. By Air: To reach Mathura by air, one must land at Agra and then drive down to Mathura, which is less than 50 km away, or land in Delhi and then take NH2 to Mathura (150 Kms. ).